President Trump announced new sanctions on Turkey Thursday morning for the ongoing detention of Christian pastor Andrew Brunson. Before the sanctions announcement, Trump put additional pressure on the Turkish government last week and called directly on Turkish President Recep Erdogan to release him. Brunson was moved from a Turkish prison this week to house arrest, where he is still being treated poorly and is in declining health. He has been detained since 2016 after getting swept up in Erdogan's "purge." On Oct. 7, Andrew Brunson and his wife, Norine, were summoned to a local police station in Izmir, Turkey. At the time, this didn’t seem like anything to be worried about. The couple, originally from North Carolina, had lived for 23 years in Turkey’s third largest city, where Andrew was the pastor of the Izmir Resurrection Church, a small protestant congregation of about 25. The Brunsons had raised three children in Turkey and had applied for permanent residency. They went willingly to the police station, thinking they were finally going to get it. Instead, Andrew and Norine were taken into custody, accused of missionary activities “against national security,” and told they would be deported. Norine was released on Oct. 9 and so far has been allowed to stay in Turkey, but more than six months later, Andrew remains locked up. On Dec. 11, he was moved to a counterterrorism center and charged with “membership in an armed terrorist organization.” A judge ordered that he be detained rather than deported. 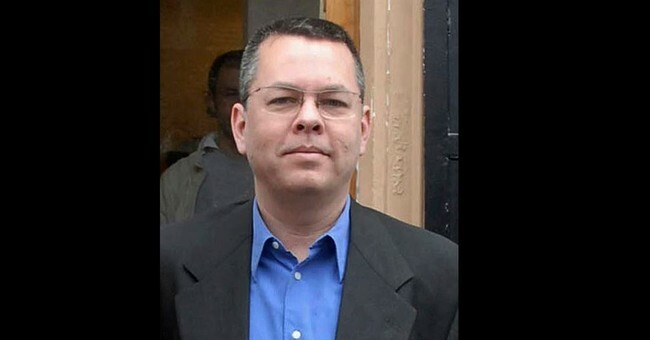 The government has accused him of a number of ginned up crimes, however, the real reason Turkey is holding Brunson is because he is Christian. The State Department will continue to push for Brunson's release.